The Heddon Lucky 13 is known for the deep, resonating sound that drives gamefish crazy when it's chugged. 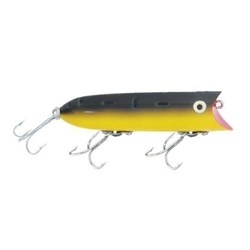 This multi-specie lure comes in two sizes: Standard 3-3/4" 5/8oz or Baby 2-5/8" 3/8oz. The standard Lucky 13 comes with three #2 treble hooks while the "baby" size comes with two.